Here at Abdul’s we pride ourselves on using fresh ingredients for all our dishes, from the meats we use right through to the vegetables and our authentic blend of spices. That’s what makes our curries so delicious. 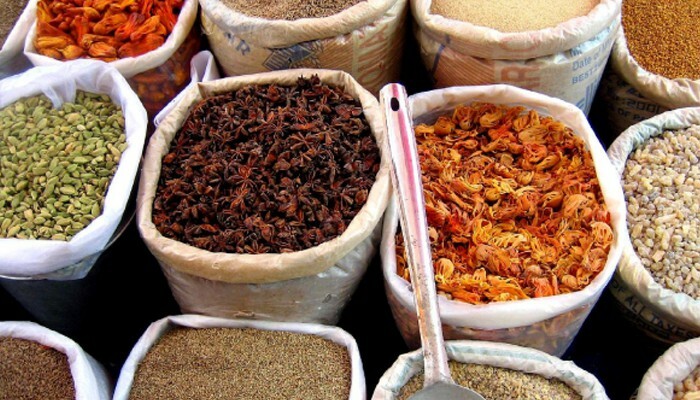 This year is the 16th National Curry Week and to celebrate, Abdul has created a list of his 16 must have spices and the blends that are essential when it comes to making the perfect dish. Coriander Seeds –Dry seeds with a light brown or golden colour that have a nice earthy, nutty flavour. Often ground into a powder to flavour food, buy them fresh as they lose the flavour fairly quickly when stored. Cumin Seeds – Known for its warm earthy aroma, it is used raw or cooked in hot oil to release its aroma. The roasted seeds give off a smoky flavour when ground but can also be ground raw. Fennel Seeds – Very similar to Cumin Seeds, but they are actually greener and wider. Can be dry roasted and used with tiny sugar candies to make mouth fresheners after meals. Fennel is known for its digestive qualities. Cardamom pods – Usually ground to a powder it is used in lots of Indian cooking whether with vegetables, meat, rice or even desserts. Cardamom is also an important part of Garam Masala. Mustard Seeds – There are many types of mustard seeds out there but the three most commonly used in curries are black mustard seeds which have the most pungent taste, followed by the yellow mustard seeds and the least pungent being white mustard. The seeds are usually used to season food by adding them to hot oil. Red Dry Chilli’s – These dried peppers may be ground up to make Red Chilli Powder. Saffron – This looks like little orange threads and adds a beautiful and unique flavour to dishes, can also be used in gravies and desserts. Turmeric – Gives food a yellowish colour and is also known for its antiseptic qualities. Cinnamon – Comes in two forms, stick or powder and is used mostly for savoury dishes. A few bits of the broken stick like spice can be added to oil as it heats up; this way the oil is flavoured. Sometimes it is dry roasted in a skillet before cooking, which intensifies the aroma. Cloves – Extensively used in Indian cooking, the flavour it imparts to food is strong and warm. Clove is mostly used to flavour spicy food where the whole clove is cooked in oil or ghee and also a part of Garam Masala. Nigella – Also referred to as Onion Seeds. They are mostly used in breads like naans and sometimes to season stir fries and curries. Nutmeg – These are seeds of a fruit and mainly used in ground form. Salt – Although this is not a spice it is a major ingredient for cooking with, it brings out flavour and is best used in rock form and ground. Ginger – Again, not a spice but an excellent aromatic root vegetable that adds a subtle kick to the flavour of a curry. Garlic – Another ingredient away from spices but a strong flavoursome bulb with the power to add a lasting tang to any dish. Garam Masala – A blend of spices that is an integral part of Indian cuisine. The mix contains Cinnamon, Nutmeg, Black Cardamom, Cumin, Cloves, and Mace. All of these spices and ingredients are easy to come across and if used correctly can make your dish extra delicious. Please do let us know what you try and if you have any further suggestions to add to Abdul’s spice cupboard! So the British summer time is officially over, you’re coming down with a cold and you just want to snuggle up in front of the TV. Well fear not. We have the perfect excuse to have a mouth-watering curry from Abdul’s – did you know that research suggests that there are actually medicinal properties in an authentic Indian meal. With a little help from the world-wide-web, we found details of the following studies which suggest that ingredients most commonly used in curries can actually make you feel better. Finally a medicine we all want to take! • A study found that Turmeric in your diet can slow down the build-up of plaques on the brain, slowing the main cause of Alzheimer’s – by up to 50 per cent. It has also been found to help with digestion and prevent heart attacks and cancer of the colon. • Mangos contain high levels of vitamins, so chutney could help to combat stomach acidity and is also a good blood cleanser. • Ginger could act as a pain reliever from the agony of arthritis. • Garlic has a range of health benefits, including protecting the heart by lowering cholesterol and helping to purify the blood. A lot of the curries that you will have tried will originate from hot countries, where ingredients with strong antibacterial qualities used to be required to preserve meats. With many of these herbs and spices becoming common ingredients in cooking, you can almost guarantee to have them in your cupboards. Mind you, if you’re not feeling well it’s the perfect excuse to come to Abdul’s, so stop feeling sorry for yourself and enjoy a meal made fresh for you in minutes. Mmmm delicious. We know you Yorkshire folk love a good night out, but what happens when you don’t want to get dressed up and totter around in the rain? We’ve put together a list of things you need to host the perfect party night in, so pick up the phone and use our handy hints to really get the party started! 1. Liven up your house. It’s supposed to be a fun night in so don’t have your guests sat in the living room they’re used to. You could always pick a theme, why not Asian? Lots of lively colours and candles give you a great excuse to get your guests in the mood to party. Invite the people you really love to spend time with, after all, it’s supposed to be fun, nobody likes an awkward silence! Pick some great music or a TV show that you know your friends will love. Party games are always a great way to make the night, how about have your guests each bring a game so you know there won’t be anybody refusing to get involved? The most important part of any night in. Hungry friends aren’t happy friends, and luckily here at Abdul’s we’ve got everything you need to have the perfect night in! We can provide a variety of meal deals, a menu to suit all tastes and we even do a party pack just for the occasion. We strongly suggest getting in a few side orders to keep everyone happy throughout the evening. You need to make sure you’re covered for all tastes, lagers, wines and soft drinks all go well with Asian dishes, but make sure you provide for drivers as well as drinkers. At Abdul’s you can get a selection of cold drinks, or traditional Lassies with your meals, keeping everyone happy.